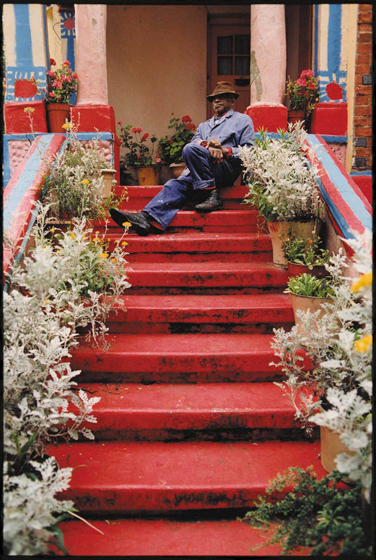 Brenton Pink on the steps of his house, Lewisham. Photo © David Secombe 1999. Brenton Pink’s house sits on Lewisham Way, a busy artery into London from the south-east. It is a large Victorian house – described elsewhere as a ‘mansion’, which might be an exaggeration – which its owner has decorated in an extremely vivid colour scheme evoking his native Jamaica, from whence he emigrated to London in the 1950s. By virtue of its prominent location, the house has become a well-known south London landmark. The photograph above is over ten years old; at time of writing, I believe that Mr. Pink is still in residence, although he is not seen outside the property as often as before. V.S. Pritchett once described London’s brick buildings as having hues “as delicate as plumage”* and their muted tones lend the older suburbs much of their drab character. Painted in primary colours, a Victorian house becomes different altogether: the candy-bright paintwork commonly seen in well-to-do suburbs of London transforms small terraced houses into would-be Italian villas. But Brenton Pink’s decoration of his home is something else: it is a memoir of Jamaica, a fragment of the Caribbean recreated in Lewisham – hardly the brightest of suburbs then or now. He is London’s own Douanier Rousseau.